FC Kansas City kept their playoff hopes alive Sunday night with a 4-1 win over Sky Blue FC in front of a home crowd of 1,571 at Children’s Mercy Victory Field in Kansas City, Missouri. The Red Stars and Pride won this weekend, which meant the Blues needed a win or else they would’ve been eliminated. 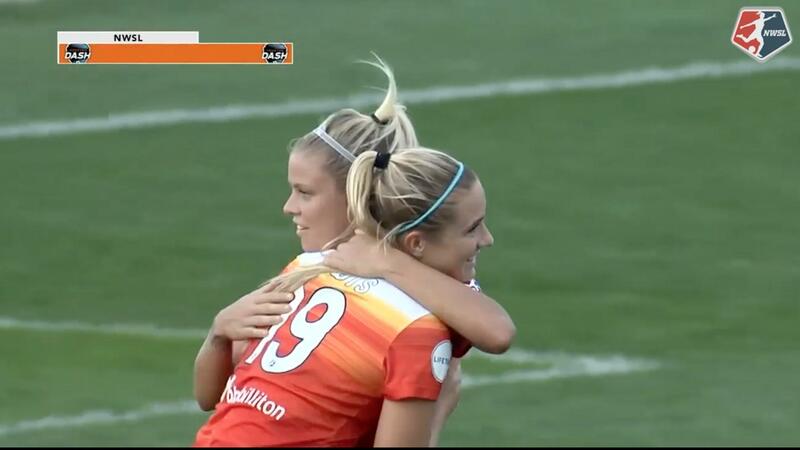 FC Kansas City’s win also means that the Thorns have clinched a playoff spot. With the win, FC Kansas City improves to 7-9-5 with 26 points. Sky Blue FC falls to 9-10-2 with 29 points. Forward Shea Groom scored twice and added an assist in the win. Sky Blue FC forward Sam Kerr, in search of her record-breaking 17th goal of the season, was kept off the scoreboard. FC Kansas City midfielder Lo’eau LaBonta opened the scoring for FC Kansas City with her second NWSL goal — and second in as many games — in the 39th minute. After a long punt by Barnhart was won by Sydney Leroux in midfield and headed on towards goal, Groom picked it up, and played it across the face of the goal. LaBonta slid in to hit it past Sky Blue FC goalkeeper Kailen Sheridan to make it 1-0. Groom would get a goal of her own, her first of the match, just five minutes later — this time, on an assist from LaBonta. Following another long kick from Barnhart, the ball bounced to LaBonta at midfield. With her back to goal, LaBonta kicked the ball over her head and into the path of Groom. Groom dribbled towards the goal before launching a bending right-footed strike from inside the penalty box that beat Sheridan to the left side of the goal. Groom picked up her brace in the 64th minute and made the score 3-0. Midfielder Desiree Scott flicked a pass to Groom on the far side of the goal. Groom’s initial shot was saved by Sheridan, but Groom jumped on the rebound for the goal. Two months ago, FC Kansas City conceded a 2-0 lead to Sky Blue and Kerr, allowing Kerr to score a 12-minute hat trick in a comeback win. But Sunday night in Kansas City, the Blues only allowed Sky Blue one goal — to Madison Tiernan in the 83rd minute. Tiernan headed in a corner kick taken by Taylor Lytle. There would be no late comeback for Sky Blue, and Sydney Leroux made sure of it, scoring in the fourth minute of stoppage time to make it 4-1 after a quick restart taken by Maegan Kelly. FC Kansas City’s Nicole Barnhart became the first goalkeeper to reach 100 games in the NWSL. FC Kansas City will next host the Chicago Red Stars on Saturday afternoon. Sky Blue FC will host the Washington Spirit on Sunday. Match ends, FC Kansas City 4, Sky Blue 1. Second Half ends, FC Kansas City 4, Sky Blue 1. Goal! 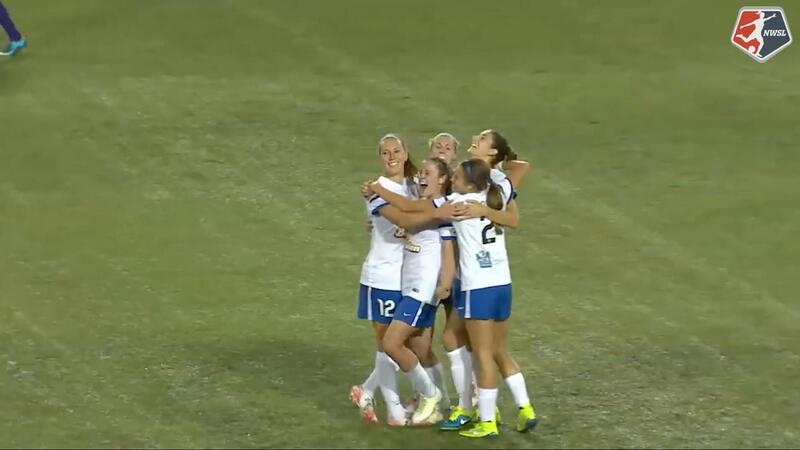 FC Kansas City 4, Sky Blue 1. Sydney Leroux (FC Kansas City) right footed shot from the centre of the box to the bottom left corner. Assisted by Maegan Kelly following a set piece situation. Attempt blocked. Caroline Flynn (FC Kansas City) right footed shot from a difficult angle on the right is blocked. Attempt saved. Caroline Flynn (FC Kansas City) right footed shot from the right side of the box is saved in the bottom right corner. Offside, FC Kansas City. Brittany Ratcliffe tries a through ball, but Maegan Kelly is caught offside. Substitution, FC Kansas City. Caroline Flynn replaces Shea Groom. Goal! FC Kansas City 3, Sky Blue 1. Madison Tiernan (Sky Blue) header from very close range to the centre of the goal. Assisted by Taylor Lytle with a cross following a corner. Attempt missed. Maegan Kelly (FC Kansas City) left footed shot from the left side of the box misses to the right. Assisted by Yael Averbuch. Attempt saved. Sydney Leroux (FC Kansas City) left footed shot from a difficult angle on the left is saved in the bottom left corner. Assisted by Christina Gibbons. Attempt missed. Maya Hayes (Sky Blue) right footed shot from outside the box is close, but misses to the left. Assisted by Madison Tiernan with a headed pass. Hand ball by Maegan Kelly (FC Kansas City). Cassidy Benintente (Sky Blue) wins a free kick on the right wing. Substitution, FC Kansas City. Brittany Ratcliffe replaces Katie Bowen. Attempt saved. Samantha Kerr (Sky Blue) right footed shot from a difficult angle on the right is saved in the top right corner. Assisted by Madison Tiernan. Delay in match Christina Gibbons (FC Kansas City) because of an injury. Substitution, Sky Blue. Madison Tiernan replaces Daphne Corboz. Goal! FC Kansas City 3, Sky Blue 0. Shea Groom (FC Kansas City) right footed shot from very close range to the centre of the goal. Attempt saved. Shea Groom (FC Kansas City) right footed shot from very close range is saved in the centre of the goal. Assisted by Desiree Scott. Attempt missed. 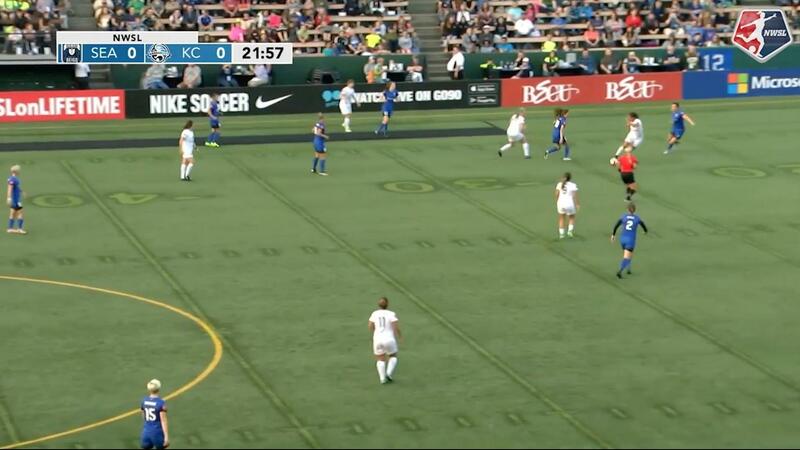 Sydney Leroux (FC Kansas City) right footed shot from outside the box misses to the left. Assisted by Maegan Kelly. Substitution, FC Kansas City. Maegan Kelly replaces Lo'eau LaBonta. Attempt missed. Christina Gibbons (FC Kansas City) right footed shot from outside the box misses to the left following a corner. Corner, FC Kansas City. Conceded by Cassidy Benintente. Attempt saved. Shea Groom (FC Kansas City) right footed shot from the right side of the box is saved in the centre of the goal. Assisted by Brittany Taylor. Substitution, Sky Blue. Cassidy Benintente replaces Kayla Mills. Offside, FC Kansas City. Shea Groom tries a through ball, but Sydney Leroux is caught offside. Attempt missed. Samantha Kerr (Sky Blue) left footed shot from the left side of the six yard box is close, but misses to the left. Assisted by Kelley O'Hara with a through ball. Attempt missed. Sydney Leroux (FC Kansas City) right footed shot from the centre of the box misses to the right. Attempt blocked. Katie Bowen (FC Kansas City) right footed shot from the right side of the six yard box is blocked. Assisted by Shea Groom. Offside, FC Kansas City. Brittany Taylor tries a through ball, but Katie Bowen is caught offside. Kayla Mills (Sky Blue) wins a free kick on the right wing. Second Half begins FC Kansas City 2, Sky Blue 0. First Half ends, FC Kansas City 2, Sky Blue 0. Goal! FC Kansas City 2, Sky Blue 0. Shea Groom (FC Kansas City) right footed shot from the centre of the box to the bottom left corner. Assisted by Lo'eau LaBonta with a through ball. Attempt saved. Kelley O'Hara (Sky Blue) right footed shot from the centre of the box is saved in the bottom right corner. Assisted by Daphne Corboz. Attempt missed. Desiree Scott (FC Kansas City) right footed shot from outside the box misses to the left. Assisted by Sydney Leroux. Goal! FC Kansas City 1, Sky Blue 0. Lo'eau LaBonta (FC Kansas City) right footed shot from very close range to the centre of the goal. Assisted by Shea Groom. Attempt saved. Samantha Kerr (Sky Blue) right footed shot from the centre of the box is saved in the bottom right corner. Assisted by Dominique Richardson. Offside, FC Kansas City. Katie Bowen tries a through ball, but Shea Groom is caught offside. Attempt saved. Sydney Leroux (FC Kansas City) right footed shot from outside the box is saved in the centre of the goal. Assisted by Brittany Taylor. Attempt missed. Kelley O'Hara (Sky Blue) right footed shot from outside the box is too high following a corner. Attempt saved. Erica Skroski (Sky Blue) header from the centre of the box is saved in the top centre of the goal. Assisted by Maya Hayes. Attempt missed. Maya Hayes (Sky Blue) header from the centre of the box misses to the left. Assisted by Daphne Corboz. Katie Bowen (FC Kansas City) wins a free kick on the left wing. Attempt saved. Sarah Killion (Sky Blue) left footed shot from outside the box is saved in the centre of the goal. Assisted by Samantha Kerr. Attempt missed. Taylor Lytle (Sky Blue) right footed shot from the centre of the box is just a bit too high. Assisted by Daphne Corboz with a cross.